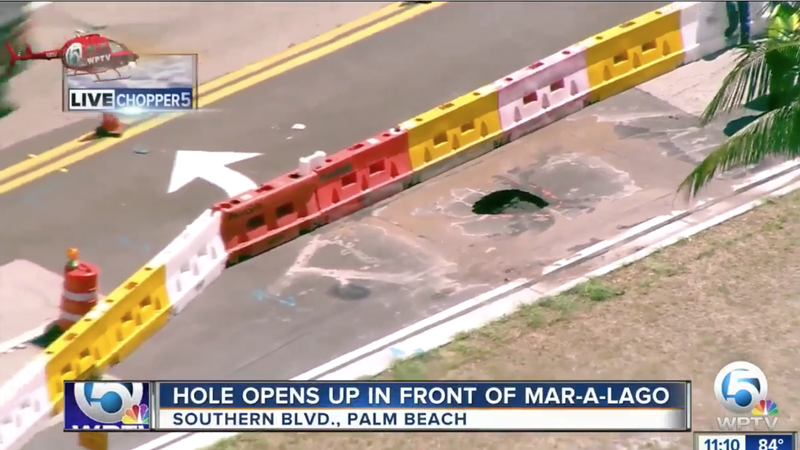 And lo, though the people did turn their eyes away, the signs continued to appear: A goddamn sinkhole just opened in the road right outside Mar-a-Lago, over by the side entrance. Word of this latest ominous admonishment from the universe comes via Time. WPTV reports the hole is something like four feet by four feet; it may be related to a newly installed water main, though of course sinkholes are a very common occurrence in Florida. “It’s a small hole, no big deal, unless you’re going onto the island—you might see a little bit of a backup,” reported an anchor. Don’t worry about any possible connection to any rumored glowing orbs. Or at least, not until dead birds begin dropping from the sky to litter the grounds of the Trump National Golf Club in Bedminster, New Jersey. Which—at this rate—should start happening sometime middle of next week. Melania Won&apos;t Hold Donald&apos;s Hand, Can You Blame Her?